This was the decisive year for Natalia LL as she decidedly exposed her artistic attitude and the links with neoavanguard art. In March she participated in Visual Arts Symposium Wrocław ’70 where, together with Z. Dłubak and A. Lachowicz, presented “Set of Optical Tools RELOP” which after proposed location in a urban space was expected to give some unusual possibilities of viewing the common places of living. This work represented the programme of art where a creative process alone was important, not a material object. In August at Visual Artists Meeting in Osieki she showed two works: “Permanent registration — Upper Odra River” and “Warrant of Arrest” which were attempts of “Idea Art” where in the place of verbal instructions were presented series of photographs. —	SP (Idea Art), Gallery “Pod Moną Lizą”, Wrocław (works: Permanent registration — 24 hours, and Warrant of Arrest) The exhibition was made of content of one of 300 identical envelopes which contained the same material and were 300 originals of the exhibition. Begins the cycle of paintings uniform in colour, according to chosen length of light wave, measured in Kelvin scale degrees. These were recordings of a face pronouncing a word, also there existed photographical versions which were already demonstrated at “Golden Grape” exhibition in 1971. In December 1973 the booklet “Permafo-Sum. Natalia LL works 1970—1973” is published by PERMAFO Gallery. The content of the booklet are series of photographs of “permanent registration” and “consumer art” alternating with recordings of artist’s name undergoing transformations. 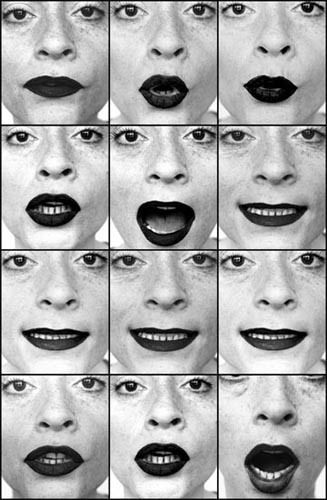 This emphasized differences of visual and verbal codes, and also a continuity of changes and their ambiguity. The exhibition was in two parts located in different places. In one place exhibited were series of photographs showing a woman’s face while eating. In the other place there was the show entitled “Instead of’. The floor was covered with sheets of paper where artist name was multiplied and on a tape-recorded were descriptions of photographs exhibited elsewhere. “Had art been identical with life most probably it would have disappeared among daily activities and behaviour. Reality as presented or described by art does not fit the image created by cognition based on everyday experiences. I destroy and fight those common and schematic experiences: seeing does not mean thinking. Art seems to operate within very complicated structures both semantic and morphological. I would advocate a constant development of research aiming at creating “uncommon” and “impossible” structures to be realized in everyday reality. The goal of this research is to elaborate the records which cannot be materialized or the materialization of which will be exceedingly difficult. Experiences from reality are necessary only as far as the formulation of morphology of signs, therefore they will serve to create the signs of possibly perfect translucence in respect to that reality. Begins the cycle: “Artificial photography”, showing pictures impossible in reality what emphasized the existence of photography as an artificial language. “Categorical Statements from the Sphere of Post-consumption Art (…) contain arguments being also postulates where the most important is the thesis about growing natural and visual complication of art — its increasing ‘artificiality’, until its final absolutisation and separation from reality (…) Art of Natalia LL is a movement, a process of growing artificiality (…) Each further stage of artificiality is necessary for constitution and confirmation of the previous stage — previous artificiality (…) It is the process of permanent condensation aiming to a pure notion (it embraces also a visual artificiality) where are contained all the other created until now notions and categories” (fragments from the text by Andrzej Sapija in the catalogue of the Natalia LL exhibition). 3-months stay in USA on the scholarship from Kościuszko Foundation. Presents the development of feminist movement in art in the text “Feminist tendency”, uttered at exhibitions in Lublin and Katowice. Reports the main points of her own programme in art in the text “Permafo and others” (Nurt no. 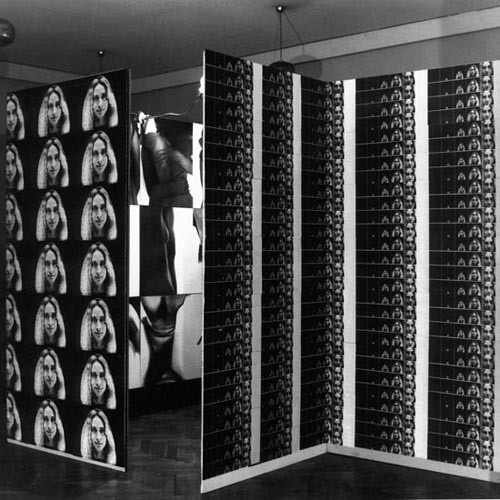 l, 1977; Data Arte, no. 27, 1977, Milan). In the text “Hypothesis” considers the problem of art and reality relations as it concerns the medium of photography. “Dreamings” were a probation to visualize the most intimate, usually unconscious experiences and proved they cannot be translated. Intimacy meant here not inner isolation but being sensitive for subtle impulses coming both from inside and outside. Seances “Points of support” showed treating a body as an antenna receptible of the whole universe influences. Continues the “Dreaming” series. Commenting it she wrote (Dream and Reality): “‘Dreaming’ is a continuation of my interest in commonplaceness and triviality as an area of artistic penetration. The programmatic artificiality of art, postulated before, manifests itself through banal and humdrum activities such as eating, sitting or breathing. (…) Thus dreams are the substance of the ‘inwardness’ of this stage of the performance and are only experienced by the sleeper. Another aspect is the visual condition, the ‘outward’ layer of ‘dreaming’ perceived by the viewers, the participants-witnesses and the seance utensils in the gallery. A third aspect is an attempt to materialize, create an equivalent of illusive dreaming, construct a fictitious document. Of course, I am aware of the defects and fragmentariness of such a procedure, hence this supplementary commentary as well as a commentary during the seance. The sense of this procedure reveals to us how closely our ‘inwardness’ is bound up with us and that it is by nature untranslatable (…) But all realities appearing in an individual dreams exist as an idea which on the one hand emphasizes the substantiality of real consciousness, but on the other, being a play of appearances, brings the extreme values of individual consciousness into the sphere of public consciousness”. The other her text about “Dreaming”, entitled: “Art as an inner experience”, was published in the booklet by PERMAFO Gallery “Unidentified Energies” in 1981. Publishes her text “Drawing Triennale — Triennale of Art”, presenting her artistic justifications as the curator of the exhibition.